This is a brilliant monograph devoted to the early modern sculptor whose bronze figures are collected in major museums as important precursor to modern sculpture movements. Maillol's massive female figures were characterized by massive volume and simplicity of form, a radical departure from 19th century Academic style, that abolished movement and recovered the simplicity of line and volume. This account opens with the artist's promising beginnings as a painter in the late 1890s, and follows Maillol's development as a sculptor through his masterpieces. Here are his first small but refined wooden bas-reliefs and the first small-scale bronzes of the years 1900-1905 that lead up to the large-scale monuments which gave him success and notoriety among both his contemporaries and modern descendants. Bertrand Lorquin is curator of the Musée Maillol in Paris and the author of Maillol aux Tuileries and other monographs on early modern artists. Diana Vierny is curator at the Musée; she was the life model for several of Maillol's later works. is very informative. The book is now in my own treasured art library. Thank you for finding a copy of this rare book. a treasure of my book collection. i can't believe i can own such a book by paying so little. this is one of my most favorite sculptors. this book brought his best works right next to my pillow. 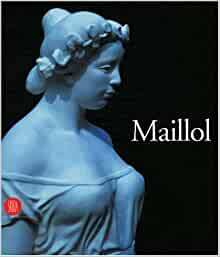 This is an excellent introduction and overview of Maillol. Very well illustrated, with many full page color photographs, it covers all stages of his life and artistic process, including, briefly, his painting, drawing, woodcut illustrations, and engravings, but its primary focus is, quite correctly, on his sculpture, particularly the monumental work. The book includes a very useful Chronology of his life with brief commentary and illustration, as well as a Bibliography, and a listing of his major one-man shows. This is not an encyclopedic, scholarly work, but rather a warmly written summary for the appreciative layman and collector. I found it very readable and informative.